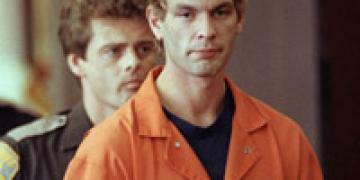 What drove Jeffrey Dahmer, who did not come from an impoverished, abusive or violent background, to become a serial killer who indulged in a spree of murder, dismemberment, cannibalism and necrophilia? Jeffrey Dahmer was born in Milwaukee on 21 May 1960, into the loving household of Lionel and Joyce Dahmer. He wanted for nothing in his formative years, and was a happy child until the age of six, when some minor surgery, which coincided with the birth of his brother, seemed to effect a change on the boy, and he became increasingly insular and lacking in self-confidence. A career opportunity for his father, around the same period, resulted in the family moving from Iowa to Ohio, and the boy’s insecurities deepened; by his early teens he was disengaged, tense and largely friendless. He claims that compulsions to murder and necrophilia had occurred to him from the age of fourteen, but it appears that the breakdown of his parents’ marriage, their acrimonious divorce, and the psychological stresses associated with these events may have been the catalyst for turning these earlier thoughts into actions.